RUSH: Let’s go to Omaha. This is Roger. Great to have you, sir, here on the EIB Network. CALLER: Hi. I appreciate all you do for America, and there’s no doubt that you’re one of the funniest, most informative broadcasters that I’ll ever see in my lifetime. CALLER: Thank you for all you do. 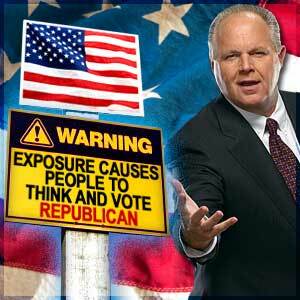 RUSH: I appreciate you saying that, I really do. CALLER: I’m a truck driver, and over the last 18 years, you’ve given me so much to laugh about that sometimes I… Well, I call it ‘the ten mile laugh,’ where you state something and I laugh for ten miles going down the road. So I can’t imagine what I must have missed in those ten miles, but anyway some of the most memorable things that I have heard on your show: you remember Luke Sissyfag? RUSH: Luke Sissyfag right now is an animal rights activist. He’s working for some nonprofit thing. In the nineties, he was working for someplace called Last Chance for Animals. His real name is Luke Montgomery, but he called himself ‘Luke Sissyfag.’ He was a member of ACT-UP, the militant AIDS group. CALLER: That’s why I remembered it. RUSH: But he’s still around. He’s an animal rights wacko now. CALLER: Okay, and I have my favorite hip-hop song of all time: Womb to the Tomb. CALLER: Is there any way that you could play that? RUSH: Yeah, we’ve had it standing by for you, ever since you requested it out there. CALLER: I’ve been sitting here, I thought of another great story that you told about back in the old days when people could say stuff on the floor of the Senate that they don’t say now. You were talking about some southern Democrat that was talking about Ted Kennedy doing offshore drilling. RUSH: Oh, yeah. Well, that was Howell Heflin. CALLER: Okay. But that story that you told, I’ll tell you what, I couldn’t stop laughing. RUSH: You want to hear the story again before Womb to the Tomb? RUSH: The thing is, this is a true story. RUSH: All right, now, here’s Womb to the Tomb, and this is by Doug Rice and the Testocles, ladies and gentlemen, from the Grooveyard of Forgotten Favorites. RUSH: That’s Doug Rice and the Testocles and Womb to the Tomb.